Thank you for your interest in one of our Cabin Rentals in North Carolina. We are a family owned and operated business that has been renting cabins since the mid 1980's with 1,000's of happy guests. Please click on any of the seven cabins to view pictures, information, and pricing. We hope we are able to accommodate your NC Mountain Cabin Rental needs. Guests staying at Sunset Farm Cabins will enjoy a friendly atmosphere along with picturesque mountain and Tuckaseegee River views. Relaxing is easy throughout the grounds on your private covered porch, around the huge fire pit, sitting at one of the picnic tables in the grass, or in one of our two hot tubs. For guests interested in playing we have a wonderful badminton court in the grass, horseshoes and other games in our outhouse to enjoy. We truly care about your satisfaction and enjoyment during your stay at one of our North Carolina Mountains Cabins. If you have any special requests or suggestions do not hesitate on bringing it to our attention. We hope to see you in one of our Cabin Rentals in North Carolina soon! 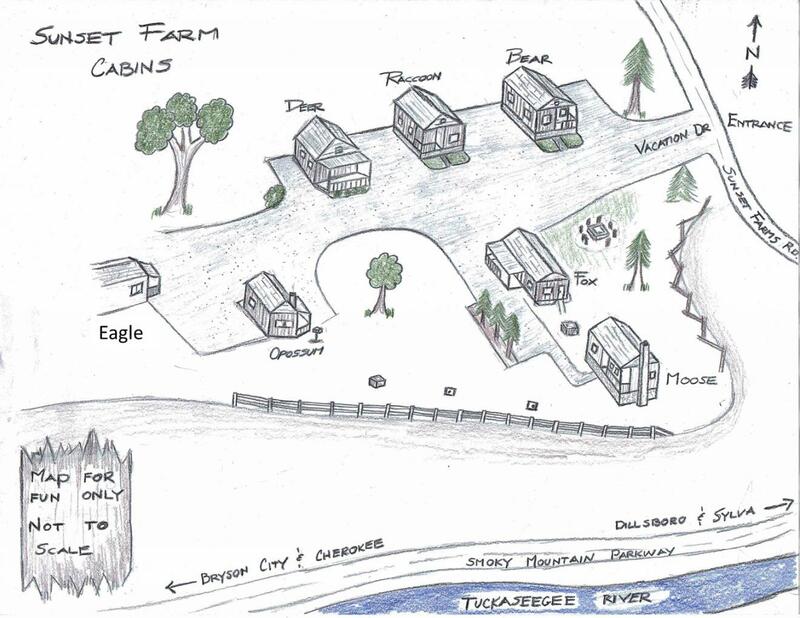 Check out our Fun Map of Sunset Farm Cabins! Here is a general break down of our amenities and prices. $5 per night for each additional guest. Max capacity 12 guests total. Max capacity 6 guests total. Max capacity 4 guests total. Recommended for 2 guests only or couples with a small child. Based on availability and a minimum 2 night stay. Minimum stay requirements may increase during certain times of the year. Specials can not be applied to Eagle. Must call office to book Eagle for less than 3 nights. Please see our //sunsetfarmcabins.com/terms-conditions.aspx page for more information. Rates do not include tax. Tax is applicable to all stays less than 90 days in duration. Based on availability and a minimum 7 night minimum. Additional nights will be prorated. Cool fact - The smoke that hangs over the Smoky Mountains is generated from the rain and evaporation from local trees. On average the Smokies receives 85 inches of annual rainfall qualifying the upper elevations as temperate rain forest. 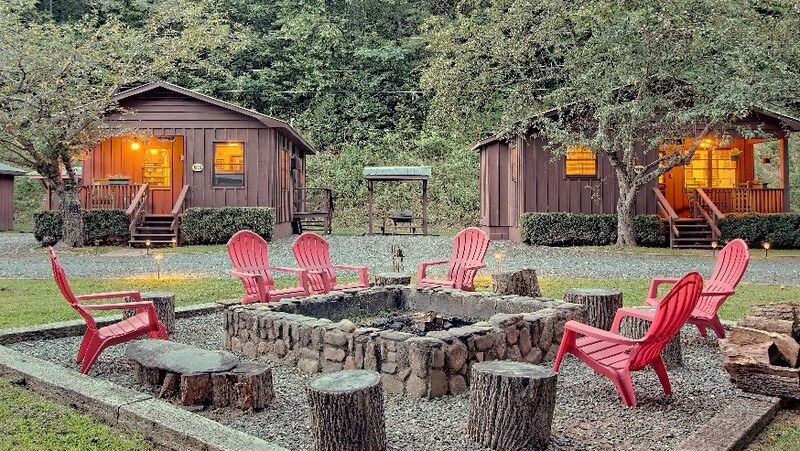 "Online reservations now available for all our " Cabin Rentals in North Carolina"